With Digitus USB Type-C Multiport Travel Dock, you always have the most important interfaces with you. The dock adds six ports to your laptop. It offers a video interface (HDMI). The highest possible supported resolution: Brilliant UHD (4K/30Hz). It also offers two USB 3.0 ports, one of which provides an extra charging function for mobile devices (BC 1.2). 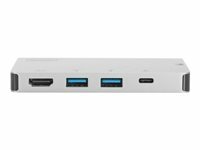 The dock also offers a USB-C port (Power Delivery 3.0 + data transfer). The whole thing is rounded off by two card readers (MicroSD, SDHC, SDXC / MMC). The compact size, low weight and stowable connecting cable make the Multiport Travel Dock the perfect companion for traveling and trips.